Tung oil is derived from the nuts of tung trees - Aleurites fordii - native to east Asia. A quality first pressed tung oil is a pale gold brown in colour and has a viscosity somewhat greater than a heavy olive oil. It is a component of many products marketed as Tung Oil but which contain as little as 10% tung oil, are usually extended with other cheaper oils and also may contain added toxic dryers and anti-fungals and solvents. Pure tung oil is foremost among a group of auto oxidising, unsaturated oils which are of interest to wood finishers. These oils harden on contact with oxygen to offer the classic, beautiful, natural oiled finish suited to numerous uses of wood. Tung oil has a very wide range of uses including on bee hives, horse stable enclosures, timber flooring, cabinetry, architectural joinery (exterior and interior), garden structures and furniture, gun stocks, didgeridoos, kitchen wood-ware and bench tops, rammed earth and stonework. Pure tung is safe for use on wooden toys (EN71 compliant) and kitchen woodwork which contacts foodstuffs. Pure Tung is mailable and has no DG rating (Dangerous Goods). See Material Safety Data Sheet (MSDS) HERE. 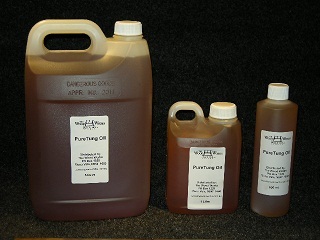 We supply Pure Tung, Citric Terpene and Gum Turpentine in 500ml, 1 litre and multiples of 5 litre 'jerry cans'. This brochure site is a companion site for The Wood Works Book & Tool Co from where we manage the secure fulfilment of our orders. Click HERE to order Pure Tung Oil. Click HERE to order Citric Terpene. Click HERE to order dyes to colour your oil. The great majority of Wood finishes can be grouped as either OIL or MEMBRANE finishes. Membrane or skin finishes include varnishes, shellacs (French polish) and lacquers. These finishes divide further into those which can be reformulated on the fly, where the newly applied finish can meld with the prior coating, (for example lacquer and shellac), or those modern varnishes which polymerise (cross link) and which have to be removed, or at least heavily scuffed (sometimes referred to as giving the surface "tooth"), to provide a key for subsequent coats or touch up. (It is precisely this final stage inertness and imperviousness resulting from the completion of the cross linking chemical bond formations that makes these modern polyurethanes - either moisture or catalyst cured - so resistant and tough). They do however usually scratch rather easily. Oil finishes by comparison, for whatever end, flooring, cabinetry etc, are by nature more penetrative and mostly "in the wood" whereas membrane or skin finishes typically sit on the wood and key with the wood with a lesser degree of penetration. Oil finishes can be regarded as preserving the look and feel of the wood better than skin finishes which, critics would say, put a plastic coating on the wood. Oil finishes can be commercial formulations with names such as Danish Oil, Teak Oil, Tung Oil Finish or Buffing Oil. The precise ingredients and their proportions is typically proprietary information. Tung oil remains an expensive ingredient so many of these commercial formulations contain a limited amount of tung and use cheaper non drying extender oils which then require toxic dryers and anti fungal additives. As a general statement nut oils derived from trees are, for wood finishing purposes, more robust than seed oils, e.g. linseed oil. The tree nut or seed oils of particular interest to wood finishing are those which have a "drying" characteristic. They include Linseed (both Raw and so called Boiled, which is, these days, usually raw with chemical dryers added), walnut, poppy seed and tung oils. These oils can be classed as unsaturated drying oils and it is this characteristic which makes an oil of interest to wood finishers. A drying oil is an oil which hardens to a tough, solid film after a period of exposure to air. The term "drying" is a misnomer - the oil does not harden through the evaporation of water or other carrier solvents as do many skin finish formulations, but through a chemical reaction in which oxygen is absorbed from the environment (autoxidation). Oil finishes can be remarkably tough, are usually superior in the patination stakes and the initial application, touch-ups or re-coats are far less problematic than with membrane finishes. Membrane finishes frequently crack when damaged and this allows penetration of moisture and dirt into the ding or crack which then discolours. Oil finishes have little skin to worry about and thus suffer less from the delamination due to dings and natural seasonal wood movement which is a given for all solid wood in service outside of air-conditioned environments. They therefore patinate better. Patina defined - the appearance of a piece, including dents, dings and the aged finish and, while mostly applied to cabinet pieces, also applicable to floors and window and door trim. Regarded as a positive and desirable attribute easily ruined with unsympathetic restoration. Tung oil is suited to wooden floors, interior and exterior woodwork including decks, window and other wooden joinery, kitchen tables and bench tops, chopping boards, concrete, stone and terracotta surfaces, rammed earth floors and children's toys. It is a preferred finish for gun stocks and didgeridoos. It is often used as a figure enhancing sealer under other top finishes such as shellacs and varnishes. While Tung Oil can be used neat it will be much more difficult to rub dry - the essential application requirement. The high grade pure tung we sell has a viscosity akin to olive oil and in most cases should be thinned before use. We recommend Citric Terpene (d-Limonene) which is distilled from orange and mandarin skins and, when more highly refined, is used as a food flavour. A 50:50 cut with Citric Terpene is our recommended mix however this is frequently adjusted a bit each way to speed penetration in ultra hard or highly absorbent woods. If harder thin more, if very thirsty you can thin less. We have had a few customers who were so delighted with the result from 1 coat they assumed 50 coats would be even better! There would be few instances where more than about 4 coats are called for. Too many coats may begin to form a membrane which is not called for with oil finishes. Surfaces to be oiled can have their base colour adjusted prior to the application of Tung Oil with the use of wood stains. Alternatively, the tung oil itself can be pre-coloured using our range of turpentine/terpene soluble aniline dyes. See HERE for more on these solvent soluble dyes. Provided you are methodical and make test runs using tinted oil is a very simple process. To use these dyes a quantity of BLACK and primary colours RED, YELLOW and BLUE are recommended. This pallette will enable you to adjust the oil colour. The most compelling advice regarding the use of these dyes and stains is to measure carefully, test mix ratios and procedure carefully and document what you do so that a successful outcome can be replicated. See HERE for graduated storage and mixing containers. See HERE for powder/liquid funnels. See HERE for pipettes for dispensing dye concentrates. A set of metal or plastic kitchen measuring spoons is very useful for measuring powders. Pure tung itself has a zero VOC rating (volatile organic compound - the off gassing compounds found in petrochemically derived thinners which are both deleterious to the atmosphere and often hazardous to breathe or come into contact with). The gases given off by Citric terpene are in fact the same as nature off-gases from orange orchards which suggests it is a more benign product to thin tung with. Note there are several grades of both tung and terpene - we sell the palest best quality of tung and a high quality water-white grade of terpene. If Citric Terpene is not available Gum Turpentine, also a tree derived product, is a good alternative. Pure tung will, in common with all oil finishes, darken the wood somewhat - more so if used straight on the raw wood, somewhat less so if used over a sealer. When considered for use on floors the floor finishing trades are accustomed to getting floor polishing jobs completed very rapidly and commercially formulated products assist with this efficiency. Pure tung demands a more considered approach. For most tradespersons the notion of applying and wiping off a finish is counterintuitive, they will tend to leave the oil to pond which may be good practice for an oil with dryers but is not an applicable method for pure tung. There is with tung oil no issue of the time window between coats such as applies to some poly-urethane finishes which can require that second and subsequent coats be applied after the solvents in the prior coat have sufficiently off-gassed but before all the chemical bonds have formed in the prior coat. Pure tung is NOT a high build "treacle" finish. Pure tung offers a low gloss 'woody' look. Pure tung is NOT a shiny membrane finish although can be buffed to a quite high lustre. Pure tung MUST be applied with thin "wiped off" coats. Do NOT allow the oil to pond or attempt to cure thick coats. Pure tung will cure to a very tough finish. After a few days the surface of the treated wood will be remarkably hard and suitable for buffing. Tung has, even when used neat, a remarkable affinity for wood and penetrates better than any oil I have used. Pure tung takes longer to cure (it has no chemical dryers added) especially in rainy or humid weather. Tung cures quicker, more completely and to a harder and far less oily finish than linseed oil. Tung does not continue to darken over time as may linseed oil. Tung is not as likely to support mould as linseed oil. Tung has a natural resistance to UV. Pure tung can be touched up with maintenance coats or applied to restore areas of high wear with relative ease. Applications of pure tung do not demand as clean an environment in terms of airborne dust or flying insects as do membrane finishes. Tung oil is very tenacious and the use of expensive application brushes is not recommended because they are impossible to fully clean. Tung oil will last far longer in storage than products with added chemical dryers. When storing keep sealed off from air, cool and dry, out of the sun and try to expel any air from the head of the container. Note that we supply 5, 10, 15 and 20 litre consignments in multiples of 5 litre plastic jerry cans filled well past their official capacity. This means only the contents of one 5 litre jerry can at a time need be exposed to air. Stored as suggested, and with minimal air in the head of the container, Pure tung can be stored for at least a couple of years. It is not recommended to over apply coats. There is unlikely to be a use where more than about 4 coats is called for. Overdoing it may cause a skin to form which is not desirable with an oil treatment. Pure Tung Oil in non-flammable & can be regarded as non-toxic. Although it smells somewhat like a salad oil it IS NOT to be used for cooking or salad dressing. Due to the slight exothermic property of the oil while curing (a commonplace feature of drying oils), there is a marginal risk that balled, oily rags may spontaneously combust - spread application rags out to dry. There is some evidence that people with peanut allergies may be affected by contact with Tung Oil. Auto ignition Temp. - 457 deg. Click HERE to see purchase options for Tung Oil.